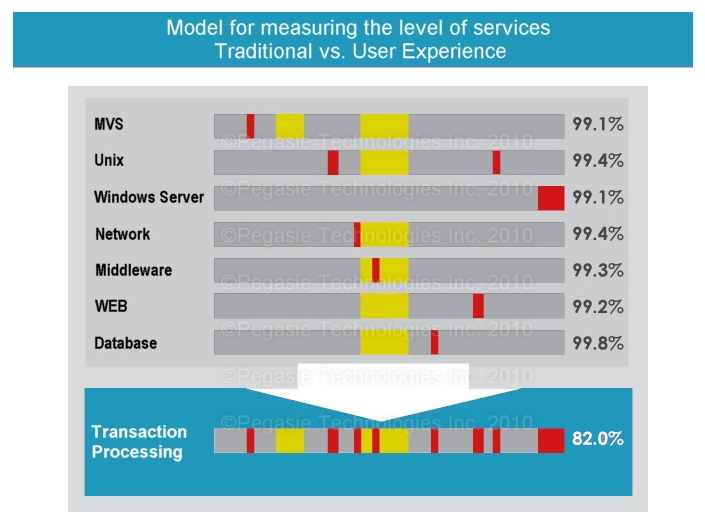 Transaction Monitoring enhances customer experience; it is the only way to manage performance proactively! The Quality and Performance of your Critical Business Transactions Reflect the Health Status (DNA) of your IT Operations. Therefore, these transactions represent a tremendous potential for IT improvement initiatives. Pegasie integrates a wide variety of solutions that leverage the potential of these transactions. Detect and resolve problems at the granular level of a business transaction. From proactive detection and resolution of end user problems to enterprise-wide business availability, Pegasie offers a full range of solutions to manage production technology performance to meet your end-user service levels and business goals. We bring the power of transaction emulation to give you full coverage, visibility and control over your technology environment with unparalleled attention to your business needs. SLAs can be deceiving. Achieving SLAs across applications, middleware, databases and infrastructure means nothing if the combined service availability fails to meet end-user expectations. Pegasie applies industry-leading tools that enable IT operations teams to design, implement and manage service levels with a true end-user perspective. More information on Our Practices ? 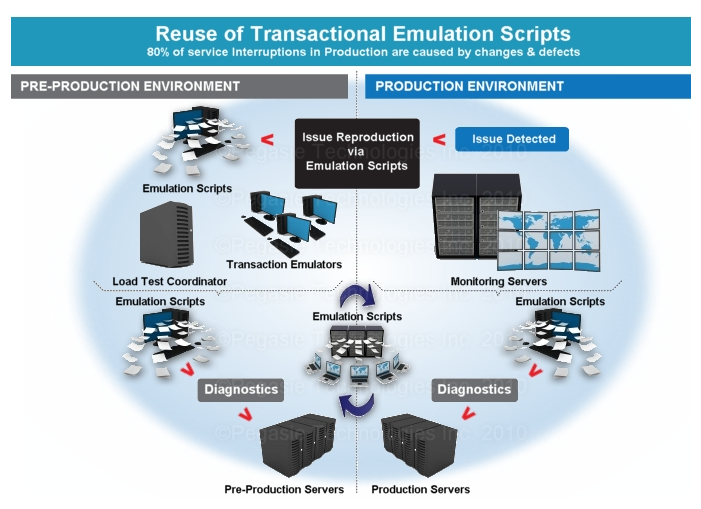 Beat your customers to the problem with Pegasie’s transaction emulation. Our End-User Management Solution gives IT Operations the ability to accurately measure and drive transactions through applications to expose performance problems before they impact your end users. Pegasie System Availability Management enables you to centrally monitor and manage system availability across an entire enterprise infrastructure. Monitor heterogeneous infrastructures integrating multiple monitoring solutions into a single enterprise view. Rise above low-level system metrics to control system availability with a true application view. Pegasie provides all the services and support you need to make the shift to a true Center of Excellence (CoE) in business availability. 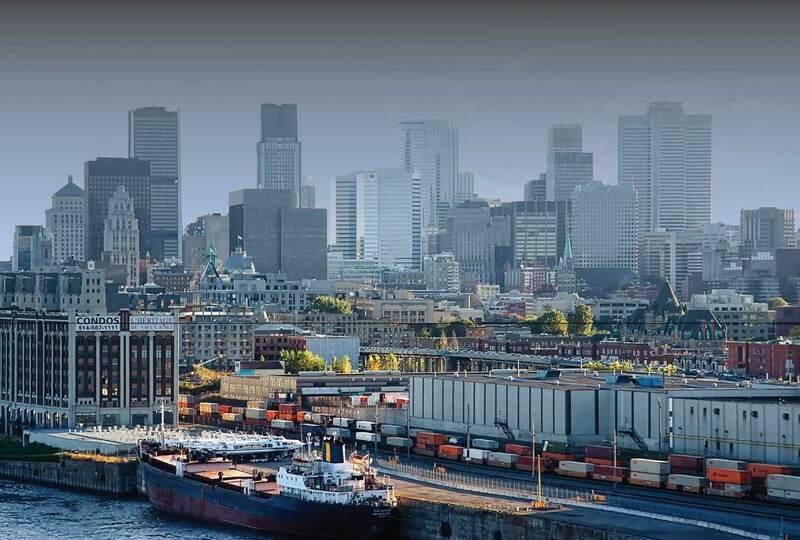 From initial set up to solving advanced complex production issues, Pegasie provides a complete range of services to enable World-Class Business Availability Management. Our expertise, access to industry-leading technologies and proprietary management frameworks accelerate implementation, reducing the risk and cost of business interruptions across your enterprise. Contact Pegasie today to talk about where your company is headed and the latest developments in business availability management. Measure and monitor end users quality of experience with agentless technology. Manage services’ levels from an end-user and infrastructure perspective. Proactively resolve problems before they impact the business. Reduce mean time to identification (MTTI). Reduce mean time to repair (MTTR) by building knowledge-based management of encountered issues. Lower total cost of ownership (TCO). Pegasie Technologies, founded in 2002, is a consulting firm that offers specialized IT services and solutions. In the last 24 months alone, we have delivered over 85 successful quality and load-testing projects. These mandates were performed across a wide range of industries such as Financial Services, Insurance, Manufacturing, and Retail.